Justin is from the Philippines, and on Sunday he sat in the stands at Wembley Stadium within arm’s reach of his favorite football team. Justin became an Eagles fan in 2004 when he visited the United States and his cousin was playing Madden NFL Football. His cousin was playing as the Eagles. Justin’s favorite color is green, and he knew the Eagles were good and that they hadn’t yet won a Super Bowl. Justin isn’t able to watch Eagles games on television or online in the Philippines. He sits in front of his computer at 2 a.m. and refreshes the screen to read the play-by-play description of the games. That’s how he follows the Eagles. “I can’t see the plays. I just wait to see what happens by reading the words and I live that way,” he said. Justin was one of the hundreds – thousands? – of Eagles fans from around the world who made it to London late last week to see the Eagles defeat Jacksonville, 24-18. While Eagles fans from the Philadelphia region poured in by the thousands (no doubt about that), the fervor was matched by fans from across the United Kingdom and from – according to those I met – Germany (a party of 10 from the German Eagles Fan Club traveled to London), Australia, Denmark, The Netherlands, Israel, Greece, Canada, France, Scotland – one fan from Scotland was also at the Eagles’ preseason games in London in 1989 and 1991 – and, no doubt, other countries that I missed. Apologies to anyone I omitted. It’s just that, well, it was mind-blowing. Playing in England was much more than about a football game, although there’s no doubt that the Eagles treated it as a business trip and they did it the right way and won a game they had to win. The travel party and the logistics of the extremely challenging road trip went smoothly and as six team buses pulled into the NovaCare Complex at 2:30 a.m. on Monday, everyone was glad to be home. But for those who lived more than just the football part of it, the experience was much deeper and impactful than could have been imagined. The Admiralty has been the Eagles' home base while in London. Take a look at photos from the pub parties that have been happening throughout the week! I arrived in London on Wednesday morning and hosted four pep rallies at The Admiralty, a British Pub in Trafalgar Square that had a can’t-miss-it Eagles flag advertising it as the “home” for Eagles fans that week. Well, it sure was. Eagles fans spilled out onto the front porch and the sidewalk and the energy was off the charts, greater each time the Eagles appeared. Alumni Jon Dorenbos and Brent Celek were part of the travel party and they signed autographs and posed for pictures, and Celek brought the UK’s Lombardi Trophy with him – as at-the-ready trophy guards watched – and the crowds went wild. The Eagles Cheerleaders and Drumline and, of course, SWOOP brought down the house with music, dancing, and chants. Smolenski came and joined the fun, pouring beers from behind the bar. 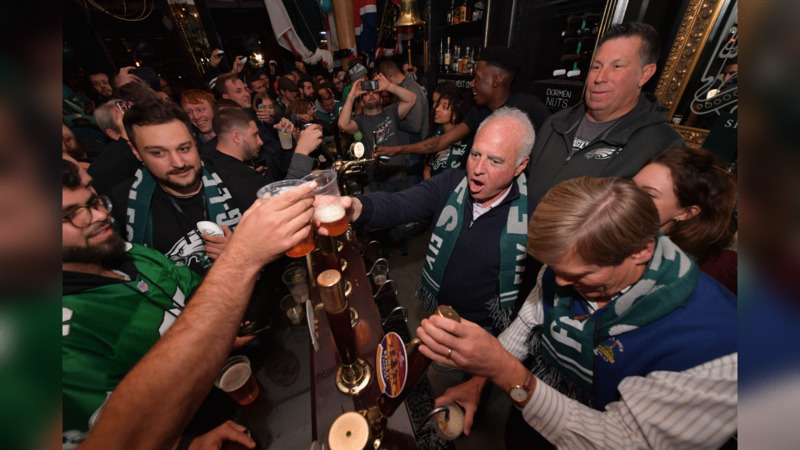 On Saturday night, Owner Jeffrey Lurie visited and spoke to the crowd and then jumped behind the bar and poured beers alongside his friend, Phillies Owner John Middleton. Then it was gameday. And while the in-house video boards and program at Wembley Stadium was a Jacksonville production, the Eagles fans overwhelmed the afternoon. 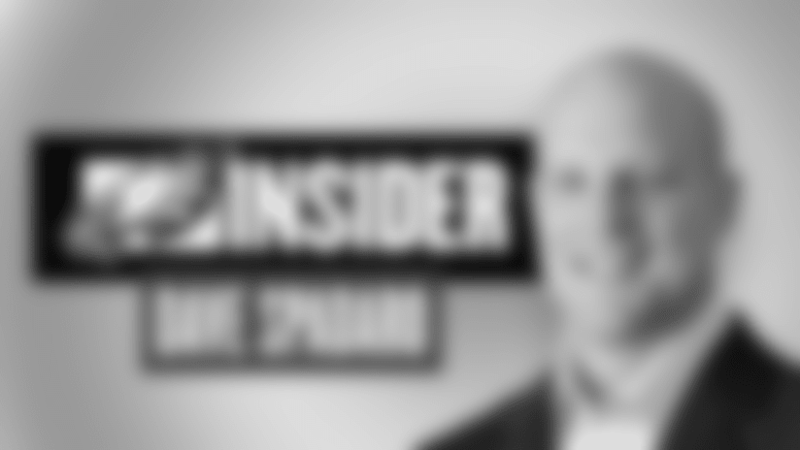 When Dorenbos, interviewed on the sidelines during a break in the action, stole the show and said, “Just one time, E-A …,” the response was a thunderous chant that brought the walls down. Certainly, Eagles fans do travel well but we usually focus on the migration from the tri-state area here (Pennsylvania, New Jersey, and Delaware). This time, the event was global, and it left a lasting impression. Thank you for the privilege of meeting you and experiencing the love you have for the Philadelphia Eagles.